Today we have a fabulous giveaway from Figure Eight Monograms. Figure Eight Monograms makes and sells wonderful acrylic products that everyone loves, including necklaces, earrings, 3 letter monograms, key rings and luggage tags (for both men and women), ornaments, cake toppers, and cupcake toppers. They also have a complete line of truly inspirational spiritual products, as well as countless adorable acrylic products made with Lilly Pulitzer fabric print! 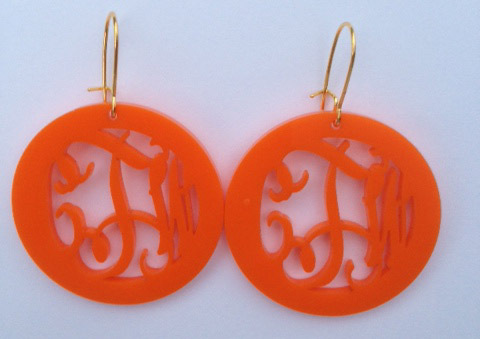 Today, Figure Eight Monograms would like to give one very lucky Clemson Girl a pair of orange monogram earrings in a monogram of their choice! Love these! And...in addition, they are throwing in an adorable Lilly Pulitzer monogrammed key chain in a monogram of the winner's choice. This is a great prize package! Deadline for all entries is tonight at 7:00pm EST. We will compile all of your entries, randomly draw a winner, and announce the winner back on the blog soon after. The winner will have 48 hours after we announce them to contact us or we will draw a new winner. Special thanks to Figure Eight Monograms for sponsoring today's fabulous giveaway! I emailed to 2 friends! Also I shared on facebook! How Cute! It is tough to find good Clemson gear on the West Coast! Liked on Facebook, mentioned on Facebook and followed and mentioned on Twitter! Liked and shared on Facebook as well. I need these orange earrings to wear in gamecock country!